Senator Barack Obama says he is close to securing the Democratic Party's nomination to run in the US presidential election in November. Mr Obama looks set to win a majority of "pledged" delegates, allocated in primary elections, although he is still short of a confirmed overall victory. With most of the votes counted, he is well ahead in Tuesday's Oregon primary. But rival Senator Hillary Clinton won Kentucky's primary by a large margin and has vowed to fight on. 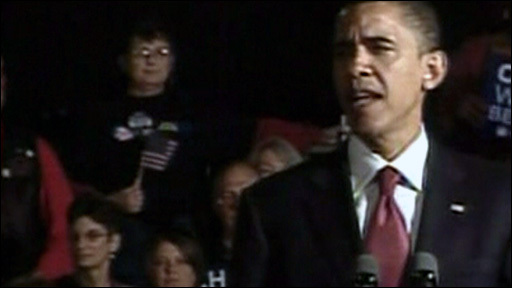 Mr Obama addressed his supporters in Iowa, scene of this year's first presidential selection contest. "We have returned to Iowa with a majority of delegates elected by the American people," he told his supporters. "You have put us within reach of the Democratic nomination for president of the United States," he said. 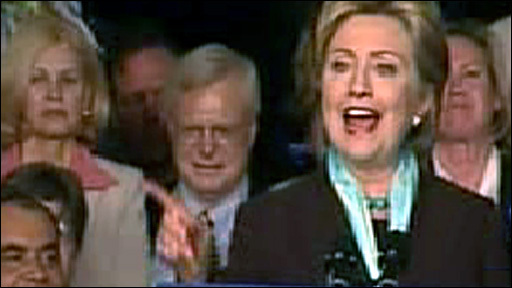 The party's presidential candidate will be chosen by party delegates at the Democratic National Convention in August. With all the votes counted in Kentucky and most of the votes counted in Oregon, Mr Obama has won 1,649 pledged delegates, surpassing the 1,627 needed to claim a majority. Mrs Clinton has won 1,497 pledged delegates. Correspondents say Mr Obama will be hoping that his majority will persuade the remaining undecided "super-delegates" - senior party members who get a vote at the convention - to rally behind him. Hailing her Kentucky victory, Mrs Clinton said she would fight "until we have a nominee - whoever she may be". In a passage seemingly directed at the remaining undecided super-delegates, Mrs Clinton said she would be "best positioned to win in November" against the presumptive Republican candidate, Senator John McCain. Mrs Clinton also said she was winning "the popular vote" over Mr Obama, although that claim has been disputed by the Obama camp. BBC North America editor Justin Webb says Mr Obama wants to suggest without quite saying so that the primary season is closing and that the general election race is beginning. But Mrs Clinton has warned Mr Obama against declaring premature victory, saying it would be a "slap in the face" to her millions of supporters so far and those states yet to vote. The remaining primaries are Puerto Rico, on 1 June, followed two days later by South Dakota and Montana. In Kentucky, Mrs Clinton won 65% of the vote to Mr Obama's 30%. In Oregon, with most of the votes counted, Mr Obama has 58.3% of the vote to Mrs Clinton's 41.7%. Exit polls conducted by the Associated Press news agency suggested that Mrs Clinton's Kentucky victory was rooted in her strong support among the state's many white working-class voters. Racial attitudes may also have motivated some Kentucky voters' decisions: of the 20% of white voters who said that race had played a part in their choice, nine out of 10 backed Mrs Clinton. Phone surveys of Oregon voters painted a strikingly different picture of that state's electorate. Mr Obama won 60% of the state's white voters, while just 10% of the state's voters said that race was important when deciding their vote, and they were split evenly between Mr Obama and Mrs Clinton. As the results were coming in, Mr Obama, Mrs Clinton and Mr McCain revealed details of how much money they had raised in April. Mr Obama raised $31m (£15.5m), less than in March but still the highest of the three presidential hopefuls. Mrs Clinton's campaign took in $22m (£11.5m), its second best fundraising month so far, while Mr McCain managed to raise $18m (£9m), his best monthly total. Are you in Kentucky or Oregon? Did you vote on Tuesday? 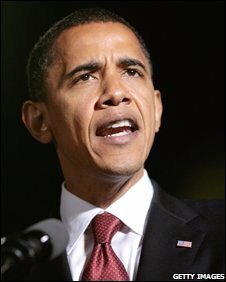 What do you think of Senator Obama's speech? Is it all over for Senator Clinton or should she fight on? Send us your comments using the form below.